After the announcement that Mattel would be purchasing Mega Brands this weekend, we thought it would be a perfect time to show you what the Megabloks line has to offer for Power Rangers Super Megaforce. Photo & Content staff member conundrum was kind enough to pick up the Megabloks Legendary Megazord set and share some images with us. This set is significantly cheaper than previous Megabloks Megazords as well as significantly smaller at only 6″ tall. Composed of 100+ fewer pieces than larger Megazord sets, this one is right up the alley of the savvy buyer, looking for a great gift for their kids. Check out conundrum’s full gallery by clicking “Discuss on the TokuNation Forums” at the bottom of this post. 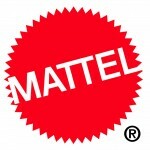 Wanting a piece of the huge success that is the LEGO Movie, competing toy company Mattel (best known for their major properties Barbie, Matchbox, Hot Wheels, and Masters of the Universe) has reached an agreement to purchase Mega Brands, the parent company of construction block company Megabloks, for a cool $480 million dollars. The construction block company Megabloks is best known for their popular series of LEGO-competing construction toys such as the Halo, World of Warcraft, and Power Rangers series of toys. They had also just launched their Call of Duty line for the company. For fans of construction toys, this now brings a major financial powerhouse to back future projects for Megabloks against LEGO and Hasbro‘s fledgling (and now Toys’R’Us exclusive) KRE-O lines of construction toys. What this means for the future of Power Rangers Megabloks is unknown – it could go on as normal, it could be given increased financial backing, or it could be left behind in favor of promoting Mattel-owend properties such as Masters of the Universe and Hot Wheels. This story was first reported by our sister site ToyArk.com, but articles can be found all over the Internet now as this deal is all but final. Discuss with us and share your thoughts! Toy Fair 2014 is winding down to a close. With that, there was a lot of news coming out from not only our coverage of Power Rangers, but also our friends Fury Diamond of SamuraiCast Blog and @trekkieb47 on Twitter. This news post should work as a comprehensive listing of all the news that came out for Power Rangers over the last couple of days. Enjoy! TokuNation.com was the first in the WORLD to bring you all the brand new images and news regarding a lot of the new Power Rangers merchandise coming out later this year. 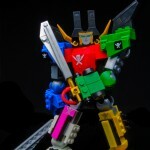 Fans salivated at the first images of the all new toy Legacy Titanus, geared towards collectors and, of course, able to combine with the Legacy Megazord and Legacy Dragonzord. 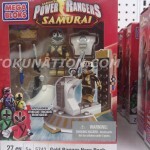 We also caught glimpse of, arguably, one of the most anticipated figures out of the Super Megaforce toy line – the Armored Might Silver Ranger figure, which uses the Gold Mode Armor version of the figure. The official name of that mode for Power Rangers has yet to be revealed (though staff here has money on it being called “Super Mega Mode” or “Legendary Mode”). We also saw the upcoming 5″ Legacy Power Rangers figures, including some surprises – Titanium Ranger, Lunar Wolf Ranger, and Gold Zeo Ranger. If you haven’t already, click here and check out all 150+ images that we took of the Bandai booth! Our good friend Fury Diamond of Samurai Cast Blog was also in attendance and took a video of his booth tour from that day. You’ve seen the pictures, now see what a booth tour is actually like! Aside from Bandai of America, the other big showing for Power Rangers was Megabloks, showing off their latest and upcoming assortments for their Power Rangers Super Megaforce line. In our gallery we saw on-hand images of the Legendary Megazord, the Q-Rex Megazord, the individual zords that make up the Legendary Megazord (including an impressive looking Sky Ship build), as well as seeing some Legendary Power Rangers make their debut in the Megabloks line. Click here to see our Megabloks Power Rangers gallery! Once again, our good friend Fury Diamond was also in attendance and took video of his time at Megabloks. If videos are more your thing, you’ll enjoy the video below! Check it out! Finally, on Monday Bandai of America held a Collector’s Event. While your only way to see the booth prior was through scheduled appointments, the Collector’s Event allowed larger groups of individuals to take the same tour in a group, getting their chance to see first-hand the same images that we’ve shown you earlier in the news post. Our good friend and host of the Power Rangers podcast RangerCommandPH, Eric, @RangerCommandPH on Twitter, took video of his experience. Check it out below! Last but not least, the company Loyal Subjects has some Mighty Morphin Power Rangers themed items coming out soon. Check out the previews of their upcoming items by clicking here to see our gallery! And as for the text-based side of the news, our own Sentai Tamashii learned a few tidbits about this year’s Power Rangers selection as well as the future of things like Legacy Items, Tokumei Sentai GoBusters, and Fury Diamond was able to get some detailed answers as well! They are listed below for you! That should just about do it! We need to give out some very special thanks to individuals who gave up a lot of free time to attend Toy Fair 2014 and provide you with all the news and information above. For starters, special thanks as always to our network administrators Tony_Bacala and Joe Moore, and HissTank.com administrator DESTRO. A special shout out to our very own Sentai Tamashii for giving up some family time to head to the show to help cover for not only us, but our sister site ToyArk.com as well. We’d also like to thank Fury Diamond of Samurai Cast Blog as well as Eric of the @RangerCommandPH podcast for the hard work and money they spent to be able to cover the show. So are you ready for some new Power Rangers? Join our discussion already well-in-progress! Check out the 40+ images in our gallery after the jump! Be sure to tweet this story and “Like” it on Facebook to share with all your friends! As reported by Rangercrew, a special Megablocks 20th Anniversary Mighty Morphin Power Rangers mini figure set will be made exclusively for Toys R Us stores. 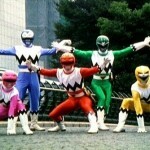 The set features the six Mighty Morphin Power Rangers, each one armed with a Blade Blaster. This set will be showcased and making it’s debut at Megablock’s SDCC booth. This mini fig set will be released in August, though the price has yet to be announced. 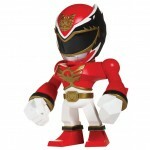 New Power Rangers Megaforce Listings, and restocks, at Amazon.com! It’s a Power Rangers Megaforce day, that’s for sure! Thanks to TokuNation.com member raz we can share with you the following new listings on Amazon.com for Power Rangers Megaforce, not to mention the restocks they have listed. Check out the links below! If you don’t like waiting for brick and mortar stores to get these products in then go ahead and order them today! CREDIT: raz from our own forums! Thanks to Tokunation boards member WuLongTi for the heads up! We have mirrored the new images, read on to check out the new figure style! 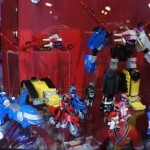 Power Rangers Megaforce Mega Bloks revealed!! 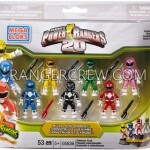 Each pack comes with a Mega Mode Ranger mini-figure. Happy hunting, and check out them out after the jump!